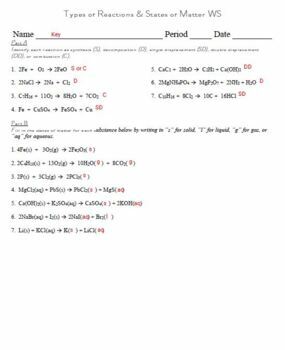 This worksheet has 7 questions requiring students to simply identify the type of reaction for a chemical equation. There are 7 additional questions requiring students to fill in the expected states of matter for products of a reaction. There are 8 more questions requiring students to identify whether a reaction is likely to occur for single and double displacement reactions. This is a basic worksheet that goes well with the PowerPoint I have created for this chapter. It combines several key skills from the chapter. This product comes in WORD format, so it's easily edited.